Prepare sweet potato leaves by boiling, steaming or stir-frying to preserve nutrients. While cooking vegetables leads to slight nutrient losses, heat also helps activate some plant enzymes, vitamins and antioxidants. Get the most from your sweet potato leaves by storing them properly and cooking them for short periods of time while reserving cooking liquids for later use. Food also loses vitamins to air so use sweet potatoes immediately for the best results. 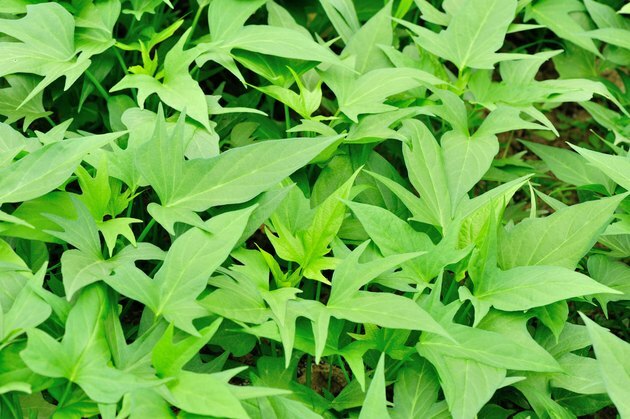 Purchase sweet potato leaves at farmers markets or ethnic food stores, because they are usually available at supermarkets. Choose sweet potatoes with dark flesh and deep green leaves to get the most nutrients. Avoid wilted or blemished greens. Wash your greens using a small amount of water, then wrap them in a damp paper towel and cover them with a plastic bag. Use a plastic bag with holes for ventilation, and refrigerate in the crisper drawer. Rinse and chop sweet potato leaves into large chunks before cooking. Use a small amount of water to prevent nutrient loss. Slice the sweet potato leaves to remove the stems. Keep the stems to enhance fiber content, slicing them into 1/2 inch chunks. Heat the oil in the saucepan over medium-high heat. Add the greens and stir to coat them with oil to prevent sticking. Add 1/4 to 1/2 cup of filtered water to the pot and stir briefly. Cover the pot and turn the heat down to medium, or use a heat setting that gives you a steady but gentle boil. Simmer just until the leaves wilt, approximately three to five minutes, depending on your altitude and type of sweet potato leaves. Remove the leaves from heat. Drain and reserve the cooking fluids and use them in soups or sauces to conserve nutrients. Drink the fluids if you prefer, but wait until they cool to a comfortable temperature. Broth from sweet potato greens is slightly bitter but also savory due to the leftover vegetable oil. Eat the leaves immediately to get the most nutrients. Serve them over brown rice or whole grain pasta and lean protein for a complete meal. Alternatively, stir-fry your sweet potato leaves with fresh ginger, sesame oil and lemon juice. Stir-frying cooks foods quickly so helps reduce nutrient loss. One 100 g serving of sweet potato leaves contains 32 calories and more than 1/3 of your daily vitamin A requirement. Sweet potato leaves also have 5.8 percent of your protein needs as well as 10.6 percent of your daily riboflavin and 6 percent of your daily phosphorous intake. New Zealand Maori people traditionally used sweet potato broth to treat acne. What Are the Benefits of Spaghetti?